Warmer temperatures doesn't mean it's time to pack the knitting away! Spring and Summer is a great time to stock up on accessories such as hats, mitts and socks; come autumn, you'll be mighty glad that you knit through the summer! Fingerless gloves are fun, quick projects to make no matter your skill level. Below are some of our favorite designs using Bijou Basin Ranch yarns. Enjoy! From L-R: Northside Fingerless Mitts by Christine Marie Chen (top), Kamala Mitts by Ruth Garcia Alcantud (bottom), Pyramid Peak Hat and Fingerless Mitts by Marly Bird, Dual Cable Fingerless Mitts by Marly Bird, and Brigand by Hunter Hammersen. 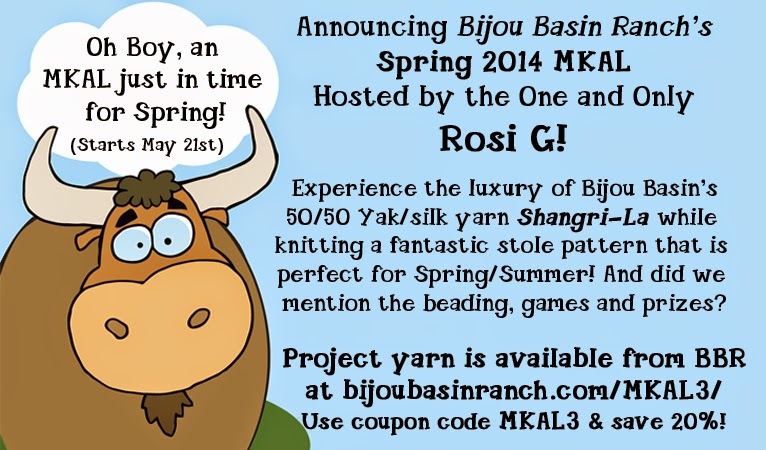 It's not too late to join the Spring Mystery KAL! It's happening now here in our Ravelry group, and it's going to be a lot of fun, Click here for a special discount on our Shangri-La yarn for this KAL event. We hope you'll join us! Coming up, we're headed to the Estes Park Wool Market! Look for us in Booth 601 and stay tuned for more details as the date approaches! You can view our full calendar of events here on our website.